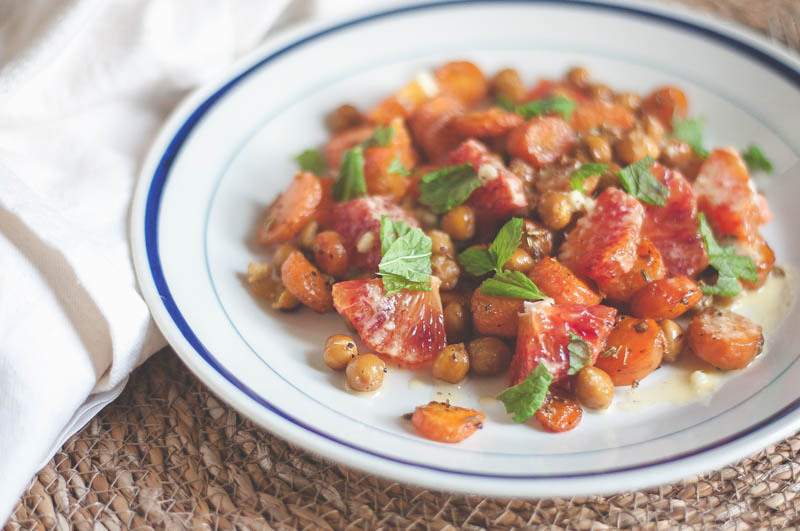 Don’t be fooled by the simplicity of this salad, it really packs a punch and is fairly substantial due to the chickpeas which provides plenty of fibre and some protein. It is fresh, warm and a perfect dish for going from colder weather to warmer days. I know that the weather is something that is beyond ones control but it is still intriguing to me how much it can impact on ones mood. I don’t know if it actually has been an unusually long Winter and cold Spring, or if it just feels that way, because we keep telling ourselves it has been… I mean I almost had a breakdown the other week when the “heatwave” didn’t turn up on said day. To be honest, I don’t mind anytime of the year when the sun shines, but there hasn’t been much of that around lately. Though I finally got around to order some seeds for this year’s GIY project (why am I always so late with it??) and the beds are almost ready for some planting, it feels late as we are now into May. That’s life I suppose, nothing you can force and it is a great way to practice mindfulness, learning to release control over things we can’t control and instead paying attention to our reactions. So as we are on the cusp of entering into a season full of lighter, more raw food based meals (at least this is what I am craving when the weather warms up) I thought this salad which is a kind of hybrid with some cooked foods and some raw, would be a nice one to share. I have made it several times and it is so delicious! Apart from the spices, you can probably buy these ingredients in your local corner shop. And even if you don’t have any green fingers at all, I bet you can keep some fresh mint alive. Seriously, it is impossible to kill! 2 tbsp good quality oil of choice – olive oil or walnut or pistachio or flax or hempseed oil will all work. Pre heat oven to 180°C. On a baking tray add the chickpeas and the carrots. Give the coriander seeds and the fennel seeds a bit of a pelting in a pester and mortar before sprinkling across your tray with the chickpeas and carrots. 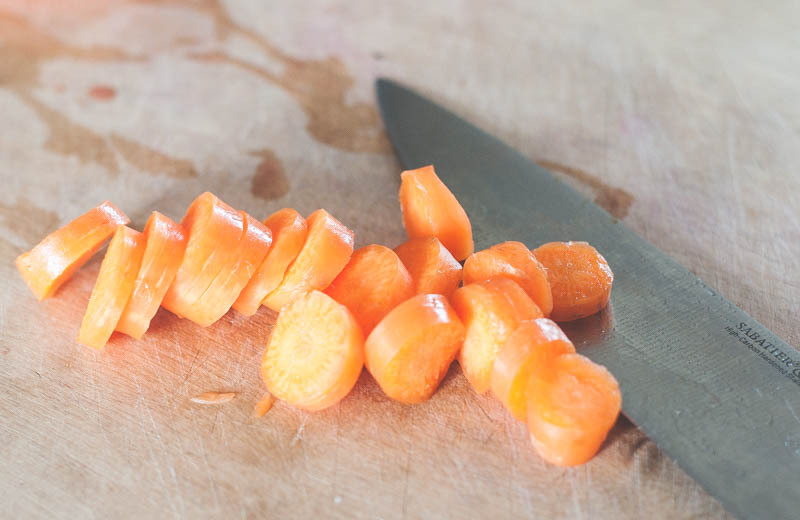 Drizzle over some olive oils and a seasoning of sea salt and black pepper then with your hands gently toss everything so that the oil and spices cover the carrots and chickpeas. Place the tray in the oven and roast for about 25 min until the chickpeas are a little bit dry and crispy. To make the dressing; add all ingredient in your blender ( I use the small cup of my nutribullet) and blend for 20-30s. Taste and season to your own preferences. 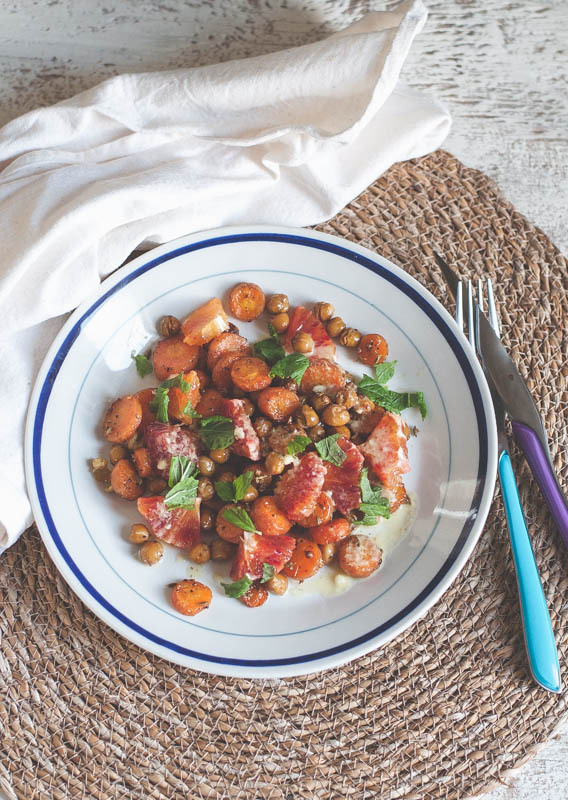 Once the carrots and chickpeas are done, add them to two serving plates. Then add the fresh orange segments, pour over the dressing and scatter the chopped mint leaves. 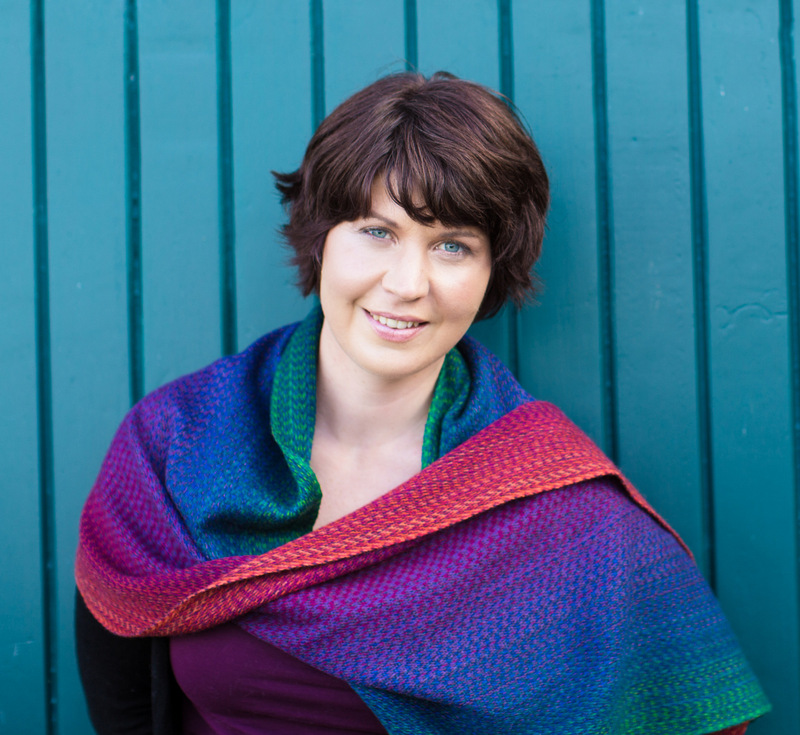 This past weekend myself and my friend Jen Ardis from Blue Heron Mindfulness held our third Nutrition & Mindfulness 1 day retreat, locally here in Fermoy. The theme for this one, was Self care and Self compassion. Both pretty important topics if you ask me! I hadn’t come across the word or the work of Self compassion as pioneered by researcher Kristin Neff, until a meditation teacher told me about her a few years ago. I immediately could see the value of incorporating it into our lives. The subtitle of her book is “the proven power of being kind to ourselves”. Such is the importance of this practice. There is so much talk these days about both self esteem, as well as self love. However, neither of those virtues are easy to develop nor will they necessarily be there for us when we need to be there for ourselves. The definition of self compassion is: ” To treat ourselves with kindness, like we would a dear friend”. So even if we are struggling with loving ourselves, we can always be kind to ourselves. Though this may sound counter intuitive, there are actually no research that being hard on ourselves works when we want to bring about change. So next time you catch yourself being overly critical, try to turn on the kindness tap instead. You may just be pleasantly surprised! But it wasn’t the importance of self compassion that I wanted to write about for this blog post. For each of these retreats we have also incorporated food, eating and recipes. This is the nutrition part(!) This time we wanted to go with something seasonal. 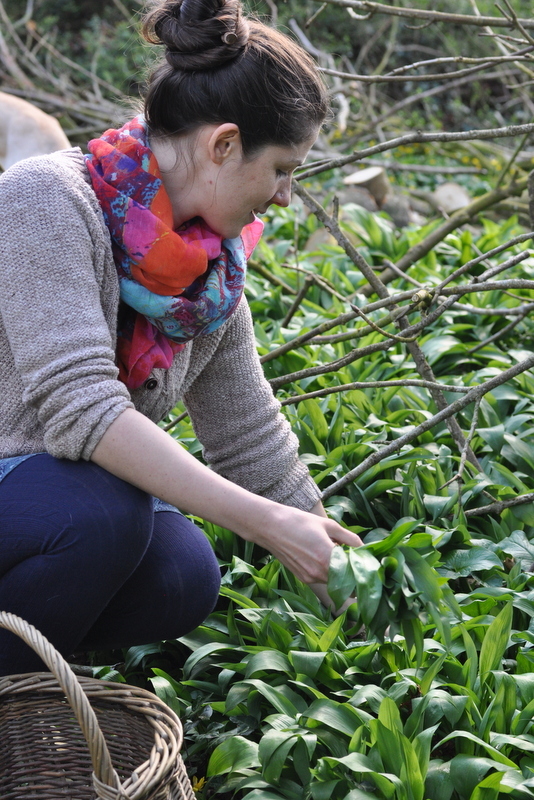 The weather is still lending itself to soup and it so happened that Jen had some lovely wild garlic growing in her garden. 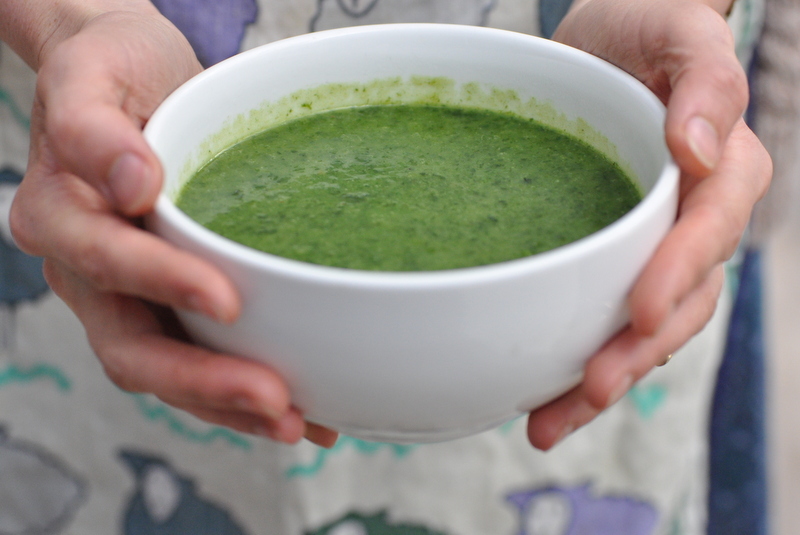 And since I’d love to include a few more foraging type recipes here on the blog this year, we decided to go for a wild garlic soup this time. It seemed fittingly with the theme of the day as well as being seasonal, and a little bit different! 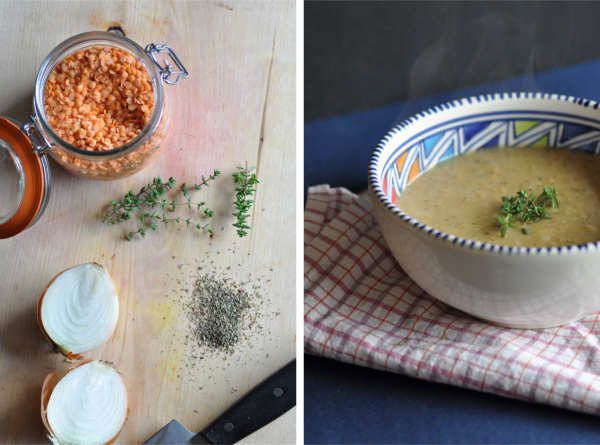 I didn’t want you to miss out on this delicious seasonal and cleansing soup, so here is the recipe! Heat a large saucepan. Add a tbsp. of olive oil, then add onion and celery and sauté until the onion is soft and transparent. Add the cubed potatoes and then add the stock. Bring to the boil and then reduce to a lively simmer. Cook for about 30 min, until the potatoes are soft. Add in the chopped wild garlic and let it wilt down. Blend the soup until it is smooth. Re heat if necessary. Taste and season according to taste. Serve! 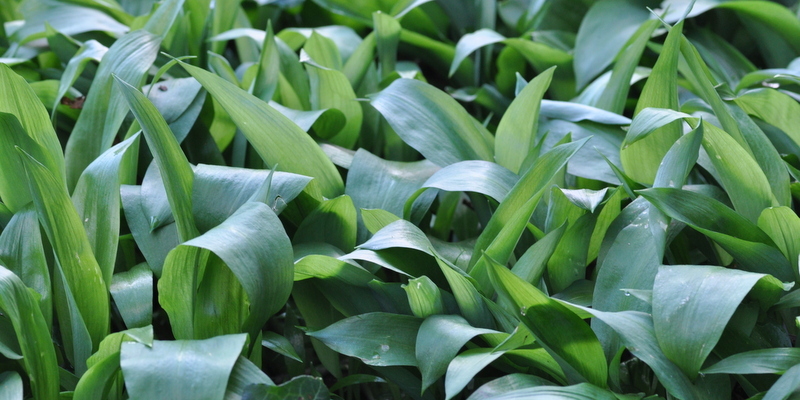 Wild garlic is also called Ramson or Ramps. They grow wild in large clusters in wet woodlands. 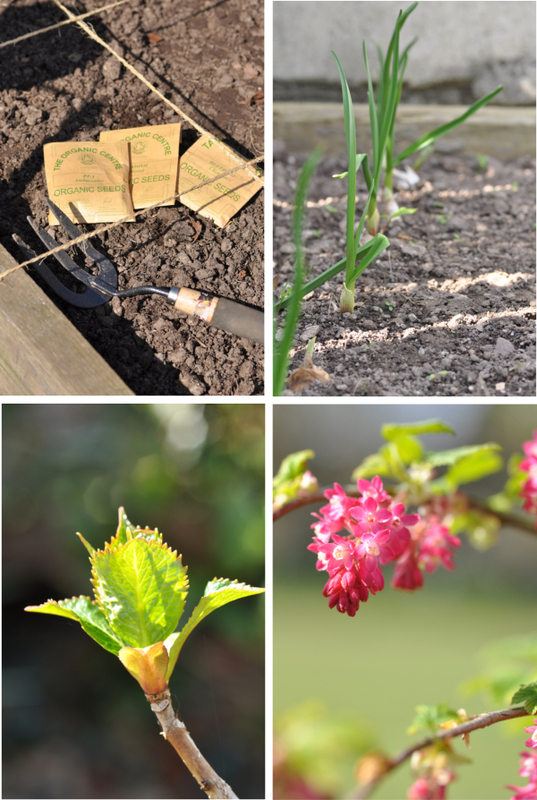 To make sure that you have the right leaves, give them a gentle squeeze to make sure they smell of light garlic. They also have small white flowers that can smell quiet strongly. The flowers are also edible. It has some anti viral and cleansing properties so perfect to help us transition from winter to spring and hopefully to the warm days of summer soon. I’m hoping to add some more of these types of recipes this year. Nettles next…?! But as I’m getting myself geared up for Whole Detox™ in about 10 days I’m enjoying a few smoothies here and there. Though I’m not really one for cold food in cold weather, (and boy is the warm winter we had turning cold and struggling to move out of the way) it can be hard to look past the convenience of smoothies when it comes to simple ways to increase the amount of fresh produce you eat. Eating enough can be such a challenge at times, and who would have thought, since the message that’s mostly thrown around it the one “eat less, move more”. I’ve even had people on some of my programmes freaking out because of the volume of food on their plate. The beauty is though that when we increase the amount of colourful plant based foods we eat, we get to eat MORE, not less. I remember doing this simple math’s exercise with a group I had on a weightloss programme a few years ago. Though, as you know I’m not a huge fan of counting calories but for this simple visual experiment they do serve a purpose. So visualise this; One 500 ml bottle of soft drink (minerals / soda / fizzy drink – pick your name) contains roughly 500 kcal. Without having a label in front of me it will give you a fair amount of sugar, probably 10-14 teaspoons (remember this is a completely man-made product so any carbohydrate content will be pure sugar and count as your “added sugar intake”). There will also be some colourings and additives, more or less depending on the type and brand you choose. Now let’s take those same 500 kcal and see how that translate into vegetables. So (from memory) 500 kcal worth of vegetable is about two full shopping bags worth! Lots of vital nutrients, fibre and volume. I would honestly think you’d struggle to chomp it all down in the course of a day. That’s why the very handy, yet simple strategy of filling half your plate with vegetables is such a powerful way to reduce the total amount of calories yet maximise the amount of quality nutrition you get. There’s a lot to be said for keeping it simple. The World Health Organisation (WHO) recommends 7-10 servings of fruit and vegetable a day for any diet to be disease preventable. 5-a-day is actually a minimum. And I see people who are only getting 2-3 at times. How many portions are you eating daily? I even know for myself when we did food diaries as project back in college, that upping it to 7-10 actually takes a conscious effort. Perhaps that’s one reason I’m so drawn to smoothies? Anyway, another thing that I realised the other day is this; What if we look at the food we eat in a symbolic way? The majority of us want to have more energy so we can do more (and even BE more) and if we have a constant feeling of lack luster and even low mood holds this may hold us back from doing all that we want. It’s seriously frustrating. I can still remember what it felt like some years ago when my energy levels where down on 3-4, out of 10. A lot of the time I just functioned and got through the day, doing what had to be done. I was constantly tired. So without a degree in nutrition and if you want to keep it simple, yet knowing that you are getting lots of essential nutrients to fuel your body and mind, think colour! Think rainbow and aim to eat a rainbow of colours every day. 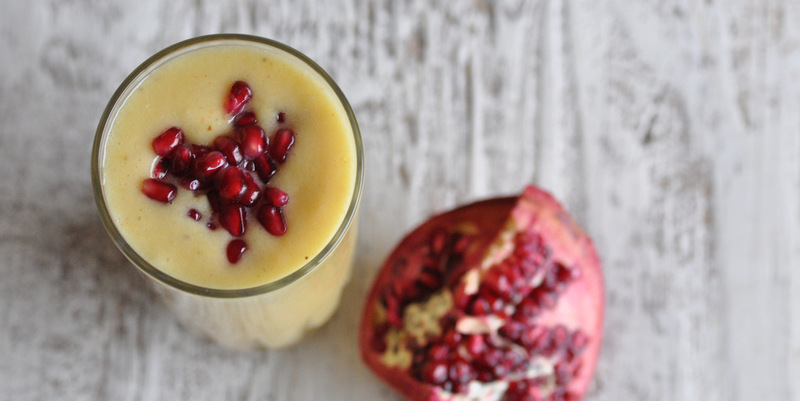 So with colour in mind, here is a yellow zingy smoothie that is sure to put some zest and brightness into your day. If you are feeling brave and have a strong blender, like a Nutribullet, then go ahead and blend the whole lemon! It sure makes for some serious digestive power! Otherwise just use the juice. Juice of one whole lemon – or peel (if you have an organic one you can blend the whole one) and use the whole fruit! Place all the ingredients in your blender and blend until smooth. Drink immediately. I thought I would share this easy to and nourishing soup with you all as we transition from Spring into Summer. April is almost over and May is fast approaching. I still feel a little behind on the blogging front… Trust me, it’s not or the lack of ideas or not wanting to write. Quite the opposite in fact. It’s just that the past few months has been filled with work on my online programme and it is slowly coming together. I’m so happy to finally have a way of working with people from all over the world, who would like to heal their relationship with food. This is a programme which goes beyond weight loss, giving you tools to deal with emotional eating and helping you becoming more in tune with who you are as an eater. Being healthy goes beyond having a “perfect diet”. We all have to eat every day but often we do it for a million other reasons than simply because we are hungry. OR, we eat out of shear necessity, completely disconnected to the food and the pleasure of the act of eating itself. ‘Distract-less’ eating is a powerful skill to master if you want to put an end to over eating and weight gain. Sound interesting? Find out more here. Thing is, life move in cycles. It goes up and down. We succeed and we fail. It is ALL part of life. And ALL of it is valuable life experiences, not just the good times. One thing I’ve learnt from practising mindfulness is to simply be aware of what’s happening right here and now. To just be present. Noticing. When we do, we find that it’s all fluid, just like the four seasons. Nothing lasts forever. Good times come and go. But the DO come again. Just like the sun eventually reappears after the rain. Maybe that’s why I like Spring so much. This season serves as a reminder that even after a long and dark winter, life slowly awakens again. It’s beautiful and it’s inspiring. And it happens every year. Here’s few images from my current Spring experience. Moving on to the recipe for this post. As it’s still a little chilly, soups are still on the menu in my house. 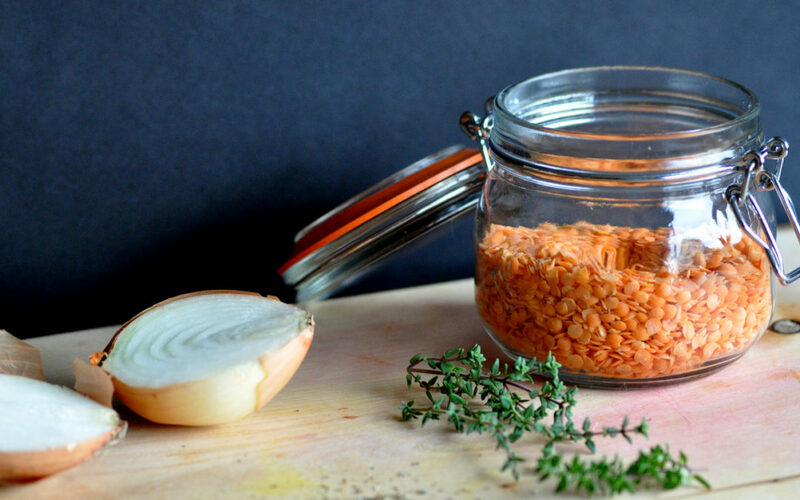 I use red lentils a lot. They are cheap and mega versatile. Perfect pantry staple! This recipe is a slight adaptation from a recipe featured in a Swedish cookbook by Catherine Schück. Her recipes are beautifully simple, using basic wholefood ingredients. This type of cooking echo’s my own cooking preferences, using only a few simple fresh, wholesome ingredients. The ingredients list for this soup is really short. It is a meat-free take on the Swedish classic Thursday staple “Ärtsoppa”, which is normally made from yellow split peas and served with bacon pieces and pancakes as dessert. Here we have skipped the bacon and used the fabulous red lentils instead. It is the marjoram which gives this soup that particular flavour that I remember from having “Ärtsoppa” in school. Trust me though; this one is so much nicer! If you want to include the pancakes you can try these or these. Heat the oil in a medium sized pan. Add onion and gently soften the onion. They should turn transparent. Add lentils. Add the stock and bring to the boil. Reduce and gently simmer at a low heat for about 30 min until the lentils are nice and mushy. If the soup is too thick, add a bit of extra water. Add the thyme and marjoram towards the end of the cooking for best flavour. Season with sea salt & freshly ground black pepper, to taste. You can use either fresh or dried herbs. Quickly blitz it if you want the consistency to be smoother. Since citrus season is almost over, I think I bough myself the last blood oranges for some time to come the other day. It’s kind of funny as I love eating oranges during the colder months but I very rarely buy them at other times of the year. Same with red cabbage for example. 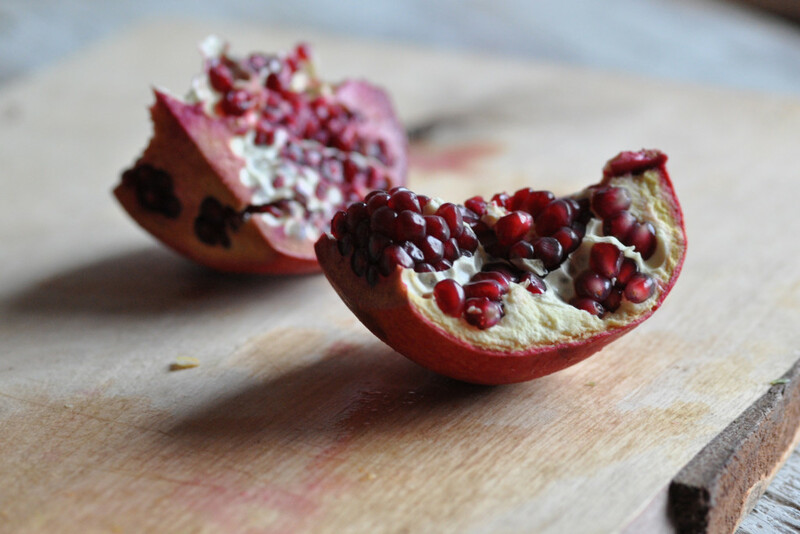 So if you have a few oranges still knocking around in your fruit basket then here’s a cool way to use them up! 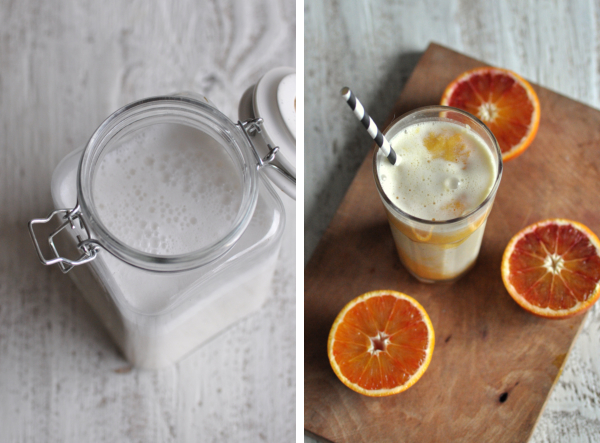 In this recipe I’ve paired my orange smoothie part with some sesame milk. As you can see I didn’t blend them together but went for a marble effect instead. Doesn’t it look cool? 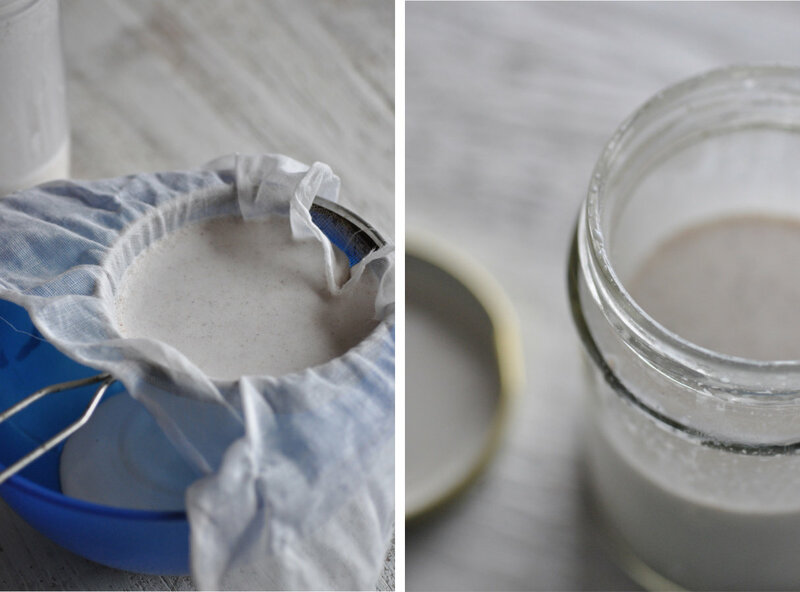 Making your own nut or seed milk is actually ridiculously easy. Every time I do make some I ask myself why I don’t do it more often. 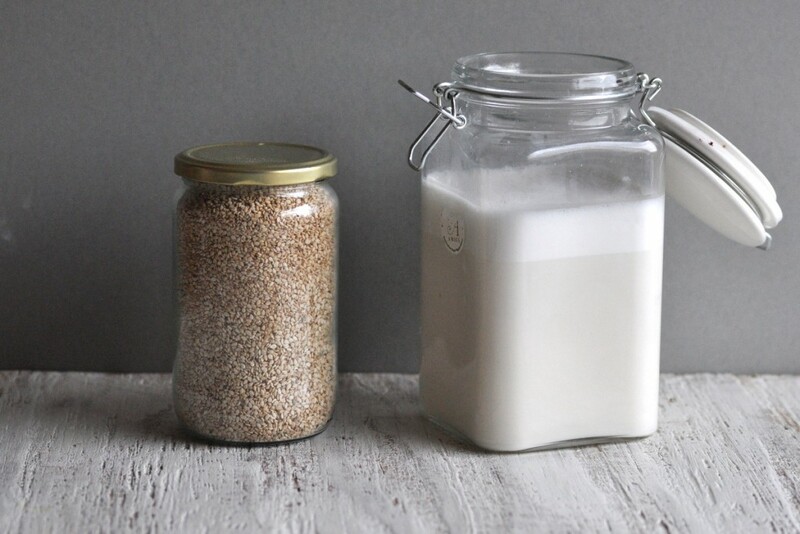 One thing to remember though is that since your own homemade milk, will contain no preservatives or emulsifiers it will separate and also it will only keep for 2-3 days so make sure you don’t make to much each time. As a change from the usual nut milk, here you have a seed milk. This dairy free alternative is suitable for those who cannot tolerate nuts. Sesame seeds are also a great source of calcium so it makes a good substitute. Though the flavour is very different to cow’s milk. Obviously. I’m a little bit behind on the blogging at the moment, but trust me it’s not for the lack of inspiration. I have lots of recipes and ideas I would like to share with you all. It’s just time… There’s been a couple of projects taking up some time recently and that’s why I didn’t manage to get this post out to last week. One of them was the recent release of my Smoothie Ebook and if you haven’t grabbed your copy yet then feel free to do so now! 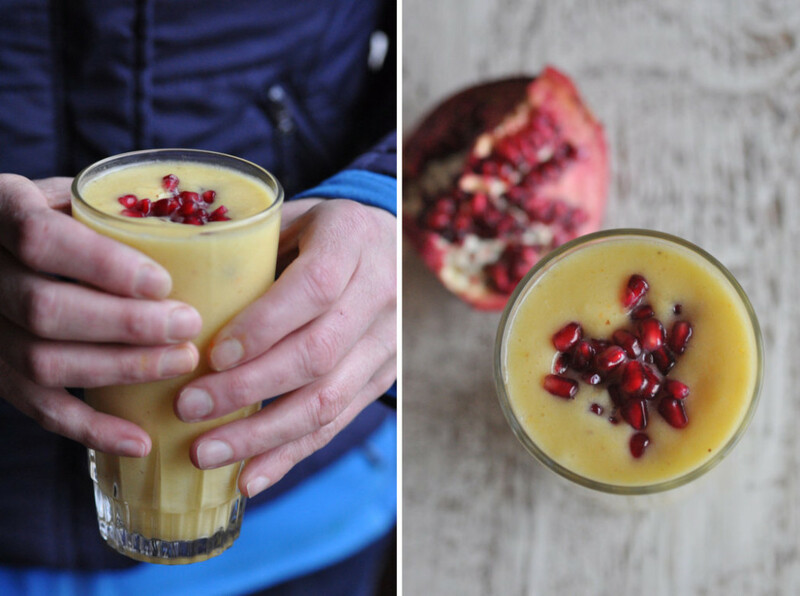 It will be a nice follow on from this recipe and the lovely sunshine smoothie Agnes shared with us last month too. The other think, which you may have noticed it the addition of a video and a subtle change in layout, banner & footers. I hope you like it as much as I do. It was necessary as my business growing and evolving. I hope you are enjoying your Easter weekend so far and if you feel like you need to balance your chocolate intake a little, then here’s a simple way to do it. 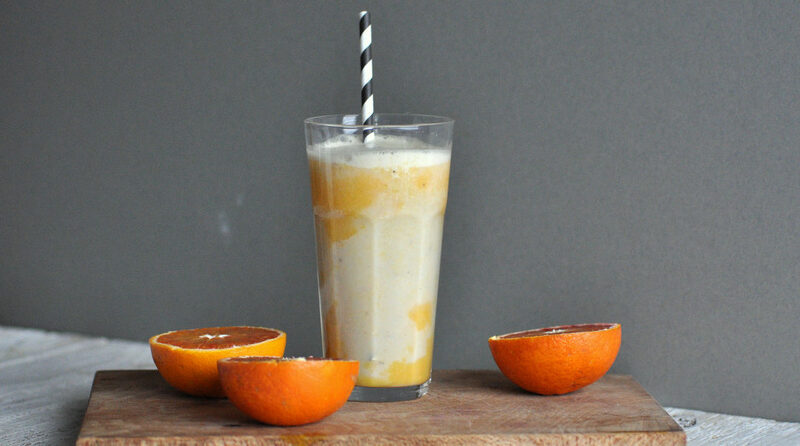 1 blood orange, peeled – or use a normal one if you can’t get any blood oranges. First blend the sesame milk with the banana. Once you have a creamy mixture, pour it into your serving glass. 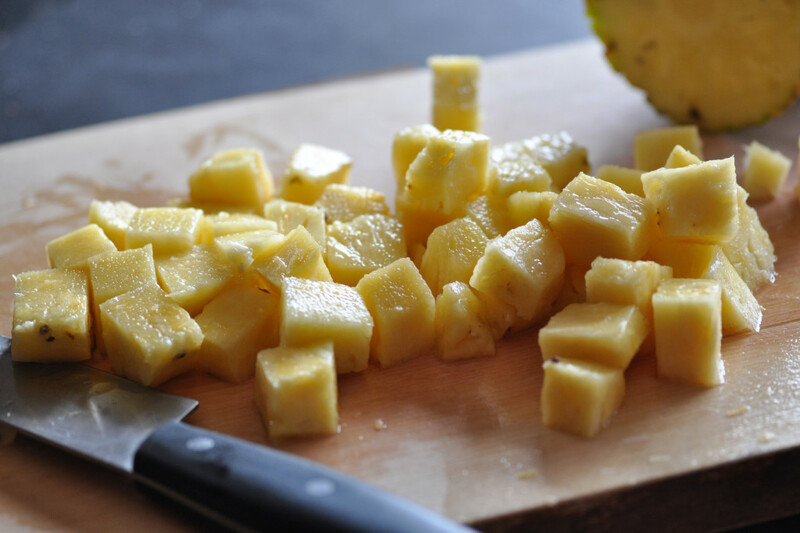 Rinse your blender and then blend mango and orange until you have a smooth puree. Add the orange-mango mix to the sesame part and watch the marble effect unfold. Soak your sesame seeds in plenty of water, preferably overnight. Once the soaking time is up, drain & rinse them again. Discard the soaking water. Blend the soaked seeds with the filtered water. You may have to do it in batches if you have a small blender like me. Once blended, strain your seed-water mix through a piece if muslin / cheese cloth or use a nut milk bag if you have one. Discard the pulp. Ideally in a compost. Blend your “milk” with some honey and a pinch of salt. Done! Store in a glass container in the fridge. As I mentioned above, it will separate so give it a shake before every time you use it. Your sesame milk will keep about three days in the fridge. You’ll now when it’s gone off as it will be sour.